The PAC senior men's team of, from the left, Shaun Walton, James Whitehead, Ben Heron and Stuart Haw. Flo Brill led the way for Nene Valley Harriers in the English National Cross -Country Relays at Mansfield on Saturday as she showed the country’s best young talent a clean pair of heels. The fledgling Harrier ran the fastest leg of the day in the Under 13 girls race for the second successive year. Brill completed the surprisingly mud-free 2k course in 6:54.85, nearly 10 seconds faster than any of her rivals, and handed over to Lottie Hemmings with Nene Valley leading the way. Hemmings and Niamh Rushton, on the anchor leg, both ran strongly, but the team slipped back to a 26th place finish against the best in the country. The Under 17 girls were the highest placed Nene Valley team coming home 22nd. Megan Ellison ran the fastest leg covering the 3k course in 9:05. Ella Robinson, Amber Park and Olivia Mead all ran well as the Under 15 girls finished 33rd. Team manager Russ Prosser had a tough task selecting the senior ladies teams, having to split six well-matched athletes into two teams. The ‘A’ team came out on top, but only just. There was a terrific battle on the first leg between Nicky Morgan, who will be making her way to Glasgow at the weekend as part of the England Masters cross -country squad, and ‘B’ team athlete Ruth Jones, and it was only in the final stages that Morgan established a slender lead. A fine last leg run from Chloe Pavey saw the ‘A’ team finish two places ahead of their clubmates in 55th position. The Under 13 boys came home 25th with Scott Oakley their fastest runner, while the Under 15 boys finished in 44th place. Junior men Oliver Bowling, Alex Hampson and James McCrae took 31st position, and the Under 17 men battled their way into 60th place. Nathan Tweedie ran the fastest leg for the senior men who finished in 74th place. 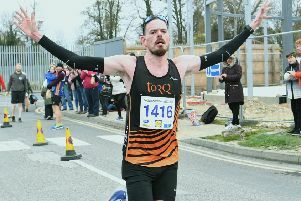 Peterborough Athletic Club’s senior men’s team produced their best ever finish in the event . The quartet of Stuart Haw, Ben Heron, James Whitehead and Shaun Walton placed 54th from the 224 teams entered. Heron and Haw also ran the third and fourth quickest times PAC athletes have ever produced on the course in the 31 years the event has taken place. Whitehead was next up with a 17:38 timing which consolidated the 56th place. Walton’s 18.19 clocking saw him pass a couple of teams bringing the quartet home in 54th place. “This is a great performance from a largely inexperienced team,” said team manager Elaine Larkins. “Only Stuart has ever run at this event before so they all should be very proud of their performances. There where teams from as far a field as Bristol in the south and Morpeth in the north competing who had many of their international athletes taking part. Keith Lowton won the second round of the midweek Harrier 5k League at Lynch Wood. Lowton’s time of 24:19 was good enough for him to hold of Peter Jeffrey of Eye Community Runners who finished runner up in 20:05. Eye Runners youngster Isaac Ellard set the fastest time of the evening with a 16:34 clocking. Louise Blake of Nene Valley was the fastest lady in 20:39. Bushfield’s Martin Glendenning currently leads the series.